Seriously? OMG! WTF?Samuel L Jackson Archives - Seriously? OMG! WTF? 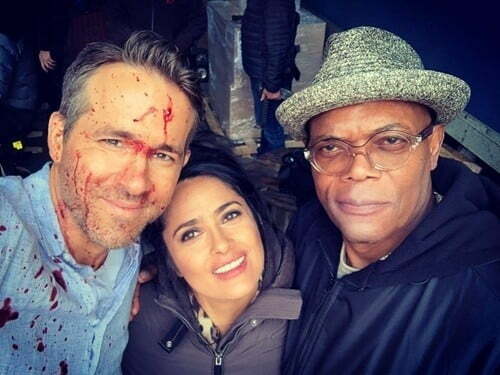 Ryan Reynolds posed with his costars Salma Hayek and Samuel L Jackson, and there is something bloody different about him. He is covered in blood and they are not. Why? All we know it is for the sequel to their movie The Hitman’s Bodyguard, The Hitman’s Wife’s Bodyguard. Wonder if they take him out? Since production began earlier this month, not much is known about the film. Back when Samuel L Jackson went to college, he was a cheerleader. James Corden had to know more, so he asked the actor about it on The Late Late Show the other night. The man, who is in like every movie, explained that he did it to meet girls because Moorehouse was an all-male school. Now it makes sense, right? Now, you know him, you know his cheer was going to have at least one curse word in it and it did. He would be like, “James, James, he’s our man. If he can’t do it, f*ck him!” And that is why Jackson is the baddest MoFo in Hollywood and why we love him! I never thought of James Corden as a brave man, but turns out he is one because he challenged Samuel L Jackson to Drop the Mic on The Late Late Show last night. Which is a Rap Battle and there is no way the CBS late night host had a chance of winning. He gave it his best shot but the biggest M*ther F*cker in Hollywood dominated it all before he even said one single syllable. Jackson treated his opponent like a snake on a plane and he was sick of it. And yet Corden gave it his best shot, but just did not have chance in hell. Samuel L Jackson acts out his motherf*cking career! Samuel L Jackson has been in so many movies, even he doesn’t know how many it has been. Yesterday, on The Late Late Show, James Corden and him acted out a small fraction of them from Pulp Fiction to Soul Men with some huge hits in between like Snakes on a Place, Star Wars: Episode I and II, Shaft and many more in an 11 minute retrospect that will make you stand up and applaud his amazing work through the decades. There is a reason why he is in so many films because no one takes over a scene like the biggest MoFo in Hollywood, Samuel L Jackson! The best part of this highlight reel was watching him laugh hysterically when something went wrong because he is always serious in his movie. He needs to do a movie where he really gets to let go and have some fun. Could you imagine Ice Cube and him doing a straight-up comedy? Actually we would be laughing the hardest because both of them would try their hardest not to crack.